When Rick was 18 years old, he started working for the California Division of Forestry as a firefighter. As a college student he continued working for the Forest Service during the summers, fighting forest fires. Last year on our vacation we visited the fire station in Weott, CA, one place where he was stationed. The crew there kindly gave the children a tour of the facilities and trucks while Rick visited with the captain. 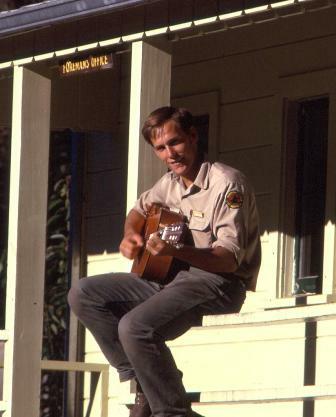 In this photo (circa 1971) the young fireman is relaxing , strumming his guitar. In college, Rick majored in Natural Resources Management, thinking to become a Forest Ranger. As he grew as a Christian, he realized that this would necessitate routinely working on Sundays merely to aid others in recreation, so he sought for another career. Still, he couldn’t seem to get away from those mighty trees, and for many years built log homes. Now, he designs log homes. He’s not exactly managing those natural resources, but is helping others use them for beauty and functionality. This entry was posted on Wednesday, February 14th, 2007 at 8:59 am	and is filed under Favorite Photos, Fun Things, Memories. You can follow any responses to this entry through the RSS 2.0 feed. Both comments and pings are currently closed. Pretty good looking guy you got there, Mom! Hunky!